A few days after the above incident, there was an onset of epidemic of plague of Nagar district. The government had introduced a vaccine to counter the illness. But, in those days, people thought that taking the injection was akin to inviting the disease. No one was willing to come forward. Therefore, the collector asked Nanasaheb to set an example before the masses and take the injection himself. But, Nansaheb's thinking was no different than the others. He was reluctant to take the vaccine. Then Baba clarified, "Nana, when you see a vegetable, think that it is my creation. This way see me in each and everything that comes before you." How simple was the remedy suggested by Baba ! Nanasaheb prostrated before Baba and agreed, "From today, I will try not to be jealous." 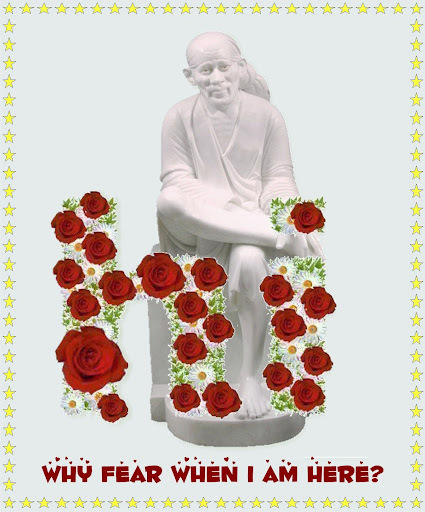 Following are feelings of an ardent devotee of Sai Baba Shri Nanasaheb Chandorkar. Dear Baba, please make me sit beside You once again and hug me. I was caught up in tangles of relations of past births. But i got You and You hugged me. You explained me rules of the world and sports of life and death. You explained the meaning of 'Pranipat' and gave me meaning of ignorance of the differences. That only helped me till my end. I also enjoyed a lot of Your ideas. I went from home to home singing Your glory. This gave so much of happiness to my soul. Whenever someone took Your name, my heart has strange feeling. Perhaps it is Your love which still calls me Shirdi. I laugh and cry by seeing Your Dwarkamai. Dear Baba, please make me sit beside You once again and hug me. This chapter (39) deals with Baba's interpretation of a verse from the Bhagawad-Gita. As some people believed that Baba knew not Sanskrit, and the interpretation was Nanasaheb Chandorkar's. Nobody believed that Baba knew Sanskrit. One day He surprised all by giving a good interpretation of a verse from the Gita to Nanasaheb Chandorkar. Mr. Nanasaheb Chandorkar, who was a great devotee of Baba, was Mamlatdar at Nandurbar in Khandesh. He got an order of transfer to Pandharpur. His devotion to Sai Baba bore fruit, as he got an order to go and stay at Pandharpur which is regarded as the ‘BHUVAIKUNTHA’ - Heaven on earth. Nanasaheb had to take immediate charge, so he left, immediately, for the place, without even writing or informing anybody at Shirdi. He wanted to give a surprise visit to Shirdi - his Pandharpur, see and salute his Vithoba (Baba), and then proceed. Nobody dreamt of Nanasaheb’s departure for Shirdi, but Sai Baba knew all about this, as His eyes were everywhere (omniscient). As soon as Nanasaheb approached Neemgaon, a few miles from Shirdi, there was stir in the Masjid at Shirdi. Baba was sitting and talking with Mhalsapati, Appa Shinde and Kashiram, when He at once said, "Let us all four do some Bhajan, the doors of Pandhari are open, let us merrily sing." Then they began to sing in chorus, the burden of the song being "I have to go to Pandharpur and I have to stay on there, for it is the house of my Lord." Importance of charity has been depicted in almost all religions and Baba, Who did not belong to any particular sect or cult, reminded His devotees of this virtue as the foremost one. Nevertheless His devotees were constantly advised to give away charity without expectation of any reciprocation and it must be free from any feeling of showing gratefulness to the acceptor. But this is not put into practice by us as required. Baba, giving advice to Nanasaheb in this respect once said, "Nana, if anybody comes to you and asks anything, let alone alms, satisfy that person's demand as per your capacity. Do not say 'No'. If you are not inclined to give, answer him humbly describing your incapacity, but do not be angry with the person or laugh at him. If you have anything with you and do not wish to give, do not give but don't lie that the thing is not with you. Deny him with due respects and bear this in mind forever". Then time came when this advice was to be put into practice and Nanasaheb did not act as advised. Baba : Gentleman, why did you resort to another way to escape from "Sarkar" (Lord Datta)? Because Sadhu (priest) will ask you for Rs.300 as promised by you? Is this the way to remember and acting on My teachings? If you did not have money or could not arrange for it, you could have disclosed it to him. Sadhu was not inclined to eat you up for not giving money. But it not correct way to drop the idea of darshan of God in order to escape from your promise to a saint. Have not thorns pricked you and your intelligent friend? So how can I talk with such personalities? Happy and sad days alternatively come in our lives. We are very much attached to our family members and are always worried about their welfare and well-being. Thus it is painful when any of our family member dies. Nanasaheb also had to face such a situation. Baba has always said to His devotees, "Everyone comes and take away what they desire and wish, but no one even asks for the treasure which I wish to give". Baba saved life of Mainatai (Nanasaheb's daughter) by sending Udi at her delivery time, but the baby died after few months. Even before birth of the baby, Mainatai's husband died. So she became widow at a very tender age and that too childless. This was a reason of worry of Nanasaheb and his family. When he went to Shirdi, Nanasaheb sat quietly in Dwarkamai. At other times, Nanasaheb and Baba used to talk with no pause and persons present in Dwarkamai drink that nectar to their heart's content, but that day it was otherwise with them. When Baba could no longer tolerate the silence, He directly started talking with Nanasaheb not minding his silence. He added and said, if you have come for baby and son-in-law to Me, then your coming here is useless. Birth and death, all these depend on previous births deeds. Even Almighty God's powers are limited in this case and they cannot bring about any change in this phenomenon. Is is possible to ask sun or moon to arise two yards away from their original position? This is not possible and if done, all balance of nature will get disturbed. Best way to keep anusandhan of the Lord. One can easily conquer jealousy, if we remember that the person's good has happened only on account of his Good deeds committed earlier. This is true, that the effects of Karma no one can escape. Before a person comes to the level of devotion, he has done some karma- both good & bad. This karma haunts him & one has to finish this store of karma before becoming free. But it is certainly possible for Sai baba to manipluate the timing & intensity of the karma effects. However later on getting devotion, all his future karma becomes posistive karma & his suffering is mimimum. Finally at the level of Sanyas/Virakti, he is free from karma effects, since he is not responsible for his karma, it being dedicated to Lord. Appa conveyed the message; but Nana – thinking “What concern do I have with a Fakir” – refused to oblige. Then Baba once again sent the same message and Nana once again refused to oblige. After this happened 2-3 times, reluctantly Nana agreed to visit Baba. A doubt lingered in his mind – Am I going to meet an ordinary Fakir or a true saint ? While this confusion harassed him, he asked his wife to give him his old coat. Wearing it, he set on the way to Shirdi. On nearing the place, he realized that he was empty handed. He was worried about what he should buy and where he can buy it – as Shirdi was a nondescript town. Thinking about this, he casually put his hand in the coat pocket. He was surprised to find a few Badams (almonds) and a few pieces of Khadi-sakhar (sugar crystals). He started thinking, “How could this happen ? What a miracle it is ? Is Baba a Sadhu ?" thanks baba ji for showing us the right path. Baba used to discuss several things freely with Nana. Nanasaheb also used to place his queries and problems before Baba without inhibitions. We are human beings. Our mind is surprised by the various deeds of the saints. But the saints consider all their deeds as normal. The things which are beyond our understanding and reach, we called them as miracles. Saints do these miracles in their ordinary course of deals. So it is not a miracle for them. Moreover we are simple, ignorant and greedy humans. That's why it is not possible for us to understand the Leelas of Sai Baba in one stroke. The Updesh which were given by Him are not difficult to remember, but difficult to follow. Here is such an incident Nanasaheb Chandorkar which shows how he forgot the teachings of Sai Baba and how Sai Baba taught him a lesson. Nanasaheb Chandorkar used to spend his holidays in his house at Kalyan. Whenever Nanasaheb and his family went there to spend holidays, the ladies in the house would prepare various types of snacks in the free time at afternoon. Once during his holidays, Nanasaheb was taking rest after having lunch on one afternoon. His daughter-in-law was making Bhajniya (a snack prepared from either wheat flour or rice flour, spices and are made in circular form commonly called “Chakri” in Marathi and “Chakli” in Gujarati). Just then a beggar wearing torn dirty clothes with came and stood at the door. There was threshold in front of the house. The house was inside the threshold. The beggar crossed the threshold and stood in front of the door and asked for food. Nanasaheb’s kind daughter-in-law took a handful of the Bhajniya and gave to the beggar. But the beggar was not satisfied and so she demanded more. Nanasaheb’s daughter-in-law took some more Bhajniya and gave to the beggar. This time too the beggar was not satisfied. The beggar again seemed to be unsatisfied and said, “I will go only after you give all them”. The beggar did not listen to daughter-in-law. Neither she took the Bhajniya nor did she return. The daughter-in-law being fed up now called up Nanasaheb. Nanasaheb ordered his watchman, “If the beggar accepts the quantity which we are giving, then its ok, otherwise push her outside of the house”. The beggar said, “Sir, if you don’t intend to give don’t give but don’t push me out of the house. I will go on my own”. Thus the beggar went away without taking a single Bhajniya. Nanasaheb’s holidays were over. He had to join his office again. In the way he went to Shirdi to take darshan of Sai Baba. Sai Baba was very angry with Nanasaheb. The moment Sai Baba saw him; He turned His face on the other side. He did not speak a word too. Nanasaheb went near to Sai Baba and fell at His feet. Nanasaheb said, “O God, please tell if I have made any mistake”. Sai Baba said, “What should I say to the one who does not follow the path directed by Me? You had thrown that beggar out of your house through that watchman. Did she do any harm to you, that you were ready to push her? If she wanted whatever you gave her, she would have taken, and if not she would have sat on the threshold of your house for sometime and would have went away. What harm was that to you, was she looting away your wealth or position? Instead of listening to her sweet words, you called your watchman to throw her out of your house. Is this that I have taught you? Nanasaheb was then reminded of his mistake now. He repented for it and promised that he would never commit such mistake ever. Though Sai Baba is sitting in Shirdi, but He went to His devotees in any form to save them. Sai baba tested Nana's character to the limit. The way a person would respond to such a situation would depend on his progress in spiritual evolution. 1. An IRRELEGIOUS/Unevolved person : would not even allow the beggar to stand near his house, let alone giving anything to the beggar, since he has no sympathy/empathy with him. The distinction between YOU & ME is very wide in this case. 2. A Commoner person, busy with his worldly life, would not drive the beggar away, but instead shut his door, on seeing the beggar. This is to avoid any further trouble. 3. A person who has some faith in god would atleast bother to enquire what the beggar needs. He may give or not give depending on the circumstances. 4. A person who has good enough progress in Spiritual evolution, will never send the beggar empty handed. He feels strong empathy with the beggar's plight & imagines himself in place of the beggar. 5. For a highest evolved person, the beggar is non-different from he himself. He will make any sacrifice for the sake of the beggar, even putting himself in unlimited trouble. This is a Mahatma !!! Sai baba must have wanted Nana to be a Mahatma. ShrI Sakharam Balwant Dhumal, an ardent devotee of Baba, was a well-known lawyer from Nasik. His word carried considerable weight in government offices. He was a staunch social reformer. From 1917 to 1925, he worked as the first non-government chairman of district local board. Due to his pre-occupation with this chairmanship, he could devote limited time to his private practice. However, the government considered his this sacrifice and honored him as ‘Rao Bahaddur’. After 1925, Dhumal once again concentrated on his private practice. Due to Baba’s blessings, his practice flourished in spite of being away from the field for 8 long years. Once, Baba said to Dhumal, “Are Bhau, I take care of you at every moment. If I don’t do so, I don’t know what will happen.” On one more occasion, Baba said to him, ‘‘Bhau, whole night I was unable to sleep.” Bhausaheb enquired “What was the reason Baba ?” Baba replied, ‘‘The etire night I thought about you and only about you.” Hearing these words of Baba, Bhausaheb was moved with mixed emotions – surprise, love and gratitude. He was sad that Baba was doing so much for a mere mortal like him. But, he was convinced that Baba was the only saviour Who will protect him from evil happening in future. Page created in 0.314 seconds with 69 queries.